Is your pet too pudgy? Pet obesity is on the rise and putting many animals at risk. The PDSA, our charity of the year, have put together some tips to help you decide if your pet is overweight. Obesity rates in Britain are soaring and unfortunately it seems our pets are heading the same way with approximately 1 in 3 of our pets being overweight. A recent report by the PDSA, our charity of the year, shows that pet obesity levels are continuing to increase. 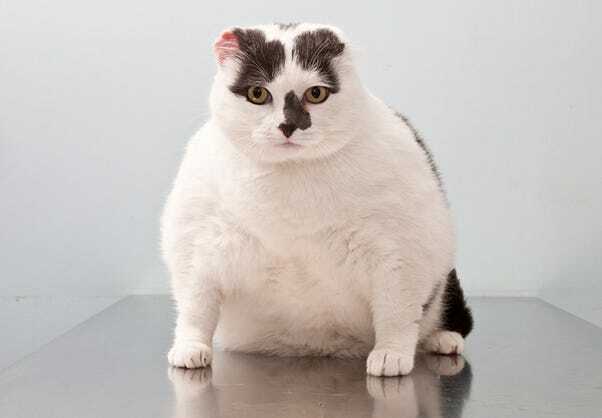 80% of vets predict there will be more overweight pets than healthy pets in five years’ time putting them at risk of joint pain, diabetes and shortened life spans. 1. Be a rib tickler! Feeling over your dog’s ribs you should just be able to feel the outline of each rib and no more. You shouldn’t be able to see the ribs (too thin) or be unable to feel each rib at all (too fat). 2. Tummy tuck: looking at your pet side-on, beyond the barrel of the chest, does the belly droop or tuck in nicely? The tummy tuck is the ideal when dogs and cats are at their perfect weight. 3. A jelly belly is a feature of excess weight in cats especially but can also be seen in overweight dogs. Puppies’ bellies can be more rounded, even if they are not overweight but a distended belly can also be a sign of worms or other problems. Always check with a vet if you are worried about your pet’s body shape. 4. Telling tails – dogs that carry too much weight often develop a fold of fat at their tail base (where it joins the body). 5. Hourglass figure – does your pet have a waist? At ideal weight pets should narrow in at the waist area (between hips and chest). This is sometimes easier to see when standing and looking down at your pet. 6. Spine tingling: although you wouldn’t expect to see the bones of the spine, feel along your pet’s back and you should be just able to appreciate the outline of the backbone. 7. Long haired pet? Sometimes a fluffy pet can look bigger than it actually is. Close your eyes and use the power of touch to feel for the spine, belly and ribs. 8. Weigh it up: although breed standard weights are not an exact fit for every dog or cat, knowing the weight of your pet at any one time is useful as it helps track increases and decreases over time. Many vet practices do weight checks free of charge. 9. 'Phone a friend'? Because you love your pet it can be difficult to look with an objective eye. If you are unsure, share these tips with a friend and ask them to check out your pet. Your local vet or vet nurse will also be happy to share their expert opinion on your pet’s weight. 10. Practice makes perfect – do a one minute body condition check every month to keep your pet in perfect shape.